Is your horse fearful, anxious, or nervous when encountering obstacles? Obstacle training Mounted Police Style can help. River House Farm manages and presents a structured and distinctive educational opportunity. Riders will be taught methods to encourage partnership. Deepening the relationship between horse and rider will promote an increase in confidence, decrease stress, and renew focus. Typical obstacle training for the horse focuses on the obstacles. However, this only provides a little short-term relief for easily spooked horses. It doesn’t address the root issue: the horse and rider relationship. 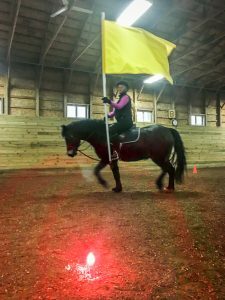 Barbara’s training in Mounted Police Style takes a very effective approach to helping horses and riders gain more confidence in many situations. She also equips riders with strategies and methods that promote the most probable outcome for success. These methods and strategies are useful and applicable for riders and horses in any discipline. Barbara has been riding since she was 8 years old. She has successfully competed in US Equestrian Federation events, Trail Trial, National show circuits and Open shows. She has earned multiple time year-end Championships for the eastern region, and national rankings in multiple disciplines. As much as she loves showing, Barbara’s real passion is teaching. She has provided lessons and horse training since 2002. Barbara has developed a skill for designing trail class maps that appeal, designing multiple trail class courses for WPCSA and Open classes through the Northeastern Welsh Ponies Assoc. Barbara met her mentor Joann Long of Gentle Dove Farm through an Open Trail Trial. Joann was one of the judges that day. Observing the level of trust between Barbara and her mount River House Kita, she approached Barbara commending her for the partnership she witnessed and encouraged her to participate in Gentle Dove Farm Obstacle Training Mounted Police Style. Barbara has been training under Gentle Dove Farm since 2014, and completed her Obstacle Training Mounted Police Style certification from Gentle Dove Farm in 2017. Contact us to discuss how a workshop or clinic with River House Farm Obstacle Training Mounted Police Style can benefit your riders and horses. Barbara is willing to provide training at facilities nationwide. A close, trusting horse and rider relationship improves the safety and pleasure of any equine discipline. Let Barbara help with certified Obstacle Training, Mounted Police Style. Barbara Bordonaro is a Gentle Dove Farm Obstacle Training Mounted Police Style Certified, and multiple-time WPCSA and Open show Champion. Book a clinic or work shop today!